The WAL-ML-1XM-3G Mini Light Tower with 3000VA Generator from Larson Electronics is an ideal solution for operators who need a fully portable yet easy to operate light system capable of illuminating large areas. Adjustable from 7 to 12 feet in height and equipped with a 3000VA generator and a 1000 watt metal halide lamp, this unit will provide over 100,000 lumens of illumination for up to 10 hours on a single tank of fuel. The WAL-ML-1XM-3G Mini light tower is a portable lighting system designed for stand alone operation and high mobility while providing enough output to illuminate approximately an acre of area effectively. Equipped with a heavy duty adjustable height tower, 3000 KVA generator, and one 1000 watt metal halide lamps, this mini tower provides operators with an easily deployed lighting system that can provide large scale illumination for up to 10 hours on a single tank of gas. The WAL-ML-1XM-3G mini light tower features an extendable tower assembly that can be adjusted from 7 to 12 feet in height for maximum coverage. A single hand crank allows operators to easily raise or lower the tower as needed, and a removable lamp mounting platform allows removal of the lamp assembly for easier transport and storage. The tower is constructed of heavy gauge steel for durability, and a tough powder coat finish provides protection against rust and corrosion. The base of the tower is fitted with two solid wheels to allow easy positioning; the operator can simply tilt the unit back and roll it into the desired location as needed. This tower is fitted with one 1000 watt metal halide lamp producing a combined total of approximately 100,000 lumens in a wide flood pattern. The lamps feature spun aluminum reflector housings, ceramic fixture bases, and tempered glass lenses for resistance to heat and shocks. Each lamp is mounted to the tower arm via a trunnion style U-bracket which allows operators to adjust each lamp independently for optimal light dispersion. A single 3000 VA generator is mounted to the base of this tower to provide standalone power for the metal halide lamps and allows for quiet operation and 6 or more hours of run time on a single tank of fuel. 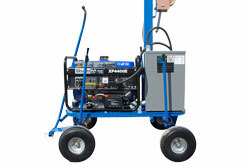 This generator also includes standard 120 and 240 volt outlets for accessory attachments, allowing operators to run tools and other equipment while also operating the lights. Larson Electronics is a manufacturer and as such offers a variety of custom options including different lamp wattages and types. 2. 1000 Watt Lamp Producing 100,000 Lumens.